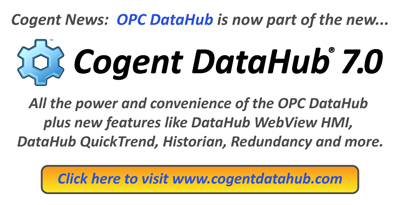 "We are very impressed with the overall quality of the OPC DataHub." Minera San Cristobal (Bolivia) - Showcase mining operation uses DataHub to share data between corporate and production facilities. Citect pushes the OPC envelope with OPC DataHub. City of Montreal uses OPC DataHub on city water project. Plastics Manufacturer accessing data for multiple purposes. OPC DataHub simplifies OPC connections at Colombian University. Mukhaizna Oil Field in Oman uses OPC DataHub for optimization. Kimberly-Clark use OPC DataHub for quality control.